Finland is phenomenon at Eurovision - it doesn't matter if the song is good or bad, the result is mainly quite poor. The Finnish music scene is different and cannot be compared to any other country. There is less "happy sound" like in the Scandinavian neighbour countries, but even more sad ballads and harder music. So in a way it was only a question of time until there will be a Heavy Metal band on Eurovision stage for Finland. 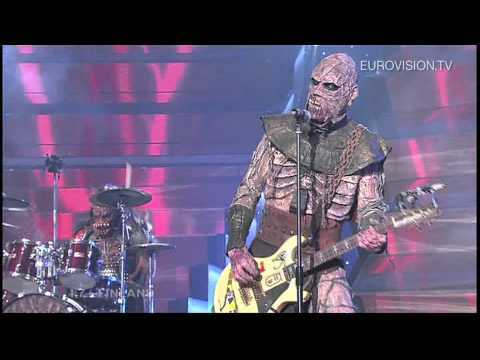 Lordi are well known in that special music scene outside the country and real Heavy Metal fans my be surprised to see this band playing at Eurovision. The Eurovision Song Contest has always been open to any styles of music. The Norwegian band Wig Wam has proved that the concept of playing rougher music was successful. But Lordi is a galaxy harder without any doubt. The outfit is extraordinary: horror-masks are worn and that's nothing for sensible people. The sound is surprisingly more melodic as you would imagine.